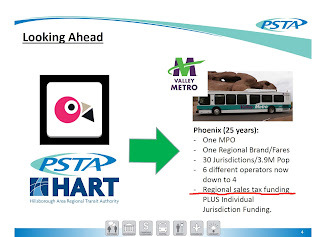 We recently posted here there is an orchestrated backdoor effort to merge HART and PSTA. After some HART Board members had issues with the Inter-local Agreement HART drafted, an MOU (Memorandum of Understanding) was subsequently drafted. PSTA held a Legislative committee meeting on January 4, 2017 where the MOU was discussed. A video of the meeting can be found here. At about 3:00 PSTA CEO Brad Miller starts the discussion of the MOU with admitting HART and PSTA already work closely together. He states the MOU is binding just like an Inter-local agreement but this MOU is more definitive about merging departments and looking at all functions to "combine". Miller said Pinellas County Commissioner Janet Long, who is pushing the regionalism agenda, spoke with HART's CEO Katherine Eagan to create a "timeline that was more important than a MOU". Miller indicated that the full PSTA Board would be "comfortable" voting for this MOU at their January 25 Board meeting. 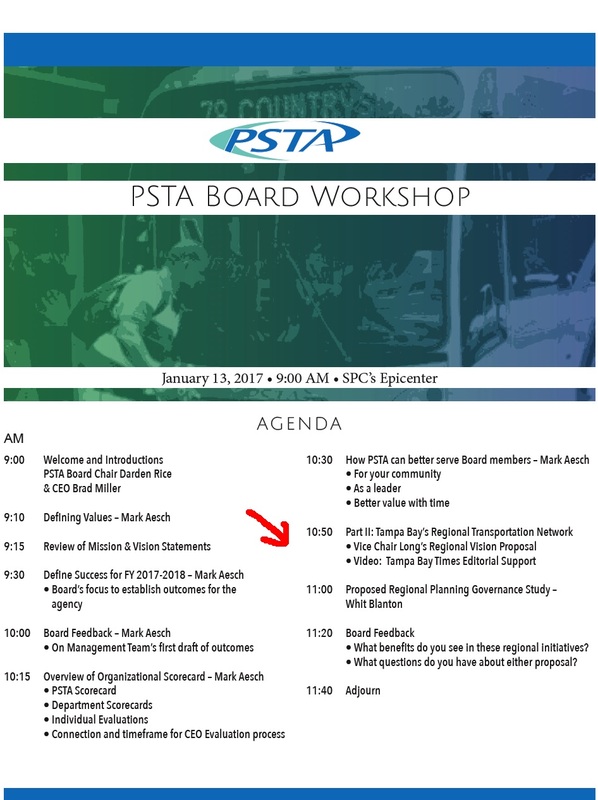 PSTA also held an Executive committee meeting on January 6, 2017 and video of that meeting can be found here. At about 2:00 in the video Miller begins speaking about the MOU stating the intent of it was to present it to the state legislature. 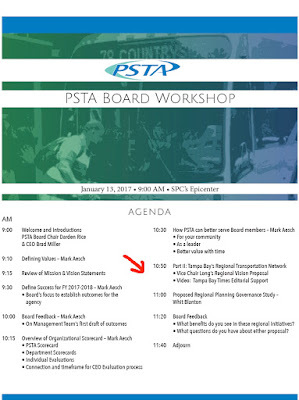 He outlined a timeline of PSTA approving it 1/25, HART approving it 2/6 and then he and Eagan and their lobbyist(s) going to Tallahassee on 2/7 to jointly present it. Such an aggressive schedule indicates the orchestration for this has been going on for a long time. Miller states this agreement fits into the larger context of a governance study they are asking the state legislature to pay for on how to implement Commissioner Long's proposed Regional Council of Governments Cronies. Miller also states "it's not going to take an act of the legislature" to do this - merging without going through a legal merger. At 6:55 in the video, the question of how funding works with this "joint" agency is asked. Through Long's proposed regional entity? Long responded that the state legislators did not like the name "Regional Council of Governments" and preferred Tampa Bay Transit Authority, confirming this is really about merging and regionalizing decision making. At about 8:30 in the video, Long states a merged entity speaking with "one regional voice" will enable the merged entity to get more federal funding. At 10:59 Long says that because the two entities were established differently - PSTA by a local bill and HART by general law, it is difficult to legally "undo"(because it would take a referendum). PSTA then held a Board workshop on January 13, 2017 off site so there is no video recording of the meeting. The agenda packet found here included Long's Regional Vision Proposal and Proposed Regional Planning Governance Study. The proposed MOU is also in the agenda packet. Long's Regional vision presentation reflects where "they" are going - REGIONAL SALES TAX FUNDING. UPDATE: Long's Regional Vision of REGIONAL SALES TAX FUNDING IS IN ADDITION TO THE EXISTING LOCAL JURISDICTIONAL PROPERTY TAX FUNDING - NOT A TAX SWAP. 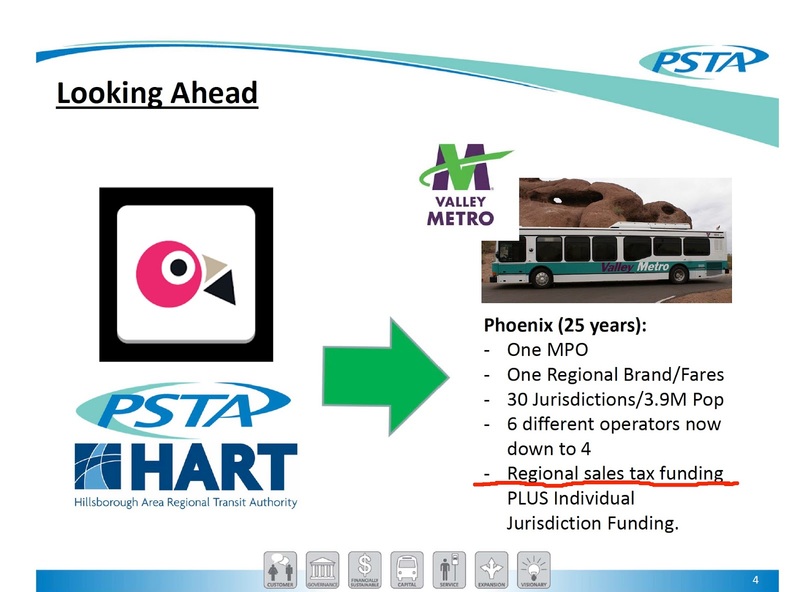 Included with Long's presentation is an editorial by the Tampa Bay Times last month supporting Long's proposal, the HART - PSTA merger and all the scheming done behind the scenes orchestrating it all. The quiet discussions are particularly reassuring in the wake of three failed transit initiatives in the bay area in recent years. This approach has the opportunity to improve bus service, ease road congestion, lay a path for regional rail, save tax money and make for smarter growth, easing the costly impacts of sprawl. To voters looking for a better strategy before agreeing to tax themselves more for transit, these are positive developments. The Times have been wrong and on the losing side of every proposed transportation sales tax hike in Tampa Bay. Including an oped of support from those who consistently lose seems odd but it does reflect how our local rail cartel operates in their own echo chamber. What's missing from their "collective" narrative? Ridership at both HART and PSTA has been declining. Innovation and technology from the private sector are driving the future of transportation which will be a disruptive factor to transit, especially on costly fixed guideways. In addition, with a new Trump Administration there will be change that very well could change the criteria and decision making for what and how federal funds are awarded. The net of all this scheming and aggressive "timeline" is to quickly ram through HART and PSTA Boards the approval of this MOU before the public can appropriately weigh in or even fully understand what is actually occurring (get it passed before the public knows what's in it). Then HART, PSTA and their lobbyists can immediately take the MOU to Tallahassee and jointly present it. The MOU is being used to get Senator Latvala's (Senate Appropriations Committee Chair) blessing to fund yet another study for how to implement Long's Regional vision and somehow the merging of the two transit agencies. The fast path of this MOU Miller expects is first approval at the January 25 PSTA Board meeting. It will then be discussed at the HART Board Legislative meeting on Monday, 1/23 at 10am. Then Miller expects the MOU to be on the agenda for approval at the next full HART Board meeting on February 6th. There is method to their madness because the transit agency merger action is being pushed in conjunction with the completion of the Tampa Bay Premium Transit Feasibility Study Plan (a post for another day) targeted for late 2018. Watch the video again and cringe. The egregiousness of recommending going around voters is appalling and PSTA was using taxpayer funded consultants and attorneys to recommend such action. Hillsborough taxpayers should not be put at any risk and we certainly do not want to bailout PSTA. HART and PSTA can and should collaborate when it is mutually beneficial but no merger is needed to collaborate. Can we stop all the "quiet discussions" scheming behind the scenes for new baseball stadiums and how to regionalize power and more time focusing on fixing our neglected roads (that 98% of us and buses use everyday), and our stormwater and sewage systems that impacts us all?